VARIOGUARD® absorbs the energy of errant vehicles by a combination of self weight, catenary action, and the mass of the impacting vehicle on the unique foot section of the barrier. GKTM are the agents in the Republic of Ireland for Varioguard steel barrier systems. Varioguard offers unique energy absorbing features and enables rapid installation. 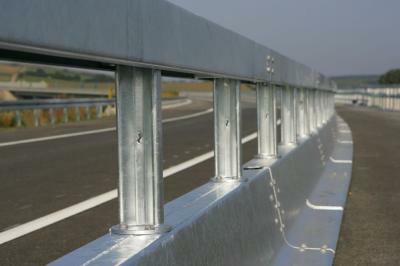 is a galvanised steel safety barrier, with a unit length of 4,000 mm, a height of 900 mm, and a base width of 700 mm. A box beam on top of the unit is connected by SIGMA type posts to the unit base. These posts are bi-directional, and because the system is bolted together, they are field replaceable. The standard element has a weight of only 400 kg, and incorporates an integrated drainage section of 120 mm x 70 mm. Varioguard is extensively tested at different performance levels, with test lengths that reflect lengths of need. Tests according to BS EN 1317:1998, at performance levels T3, N1, N2, H1, and H2 have been successfully completed. Varioguard only takes 40cm of carriageway and allows for a remarkable saving of road space compared to standard barriers, as the foot of the barrier can be driven over and also fitted with horizontal markings, thus providing an ideal solution where road space is limited. Varioguard absorbs the energy of errant vehicles by a combination of self weight, catenary action, and the mass of the impacting vehicle on the unique foot section of the barrier. It is delivered to site in pre-bolted 12 m lengths for rapid installation. In the rare event of an unforeseeable accident; such as a heavy goods vehicle overturning, Varioguard is designed to deform progressively. This feature, combined with the wide profile of the foot section ensures that there is no possibility of the system overturning.